One of Gotham's newest music rooms 54 Below has decided to feature Brazilian music this summer and two veteran BrasilerosMaucha Adnet and Helio Alvesrecently added their contributions. Performing music from Milagre (ZOHO, 2013), the duo invited clarinetist Anat Cohen and percussionist Cyro Baptista for the date. Brazilian vocalists have been populating the jazz rooms lately (I wrote about Leny Andrade a few columns back), resulting in a deeper exploration of the nuances present in the melodic innovations of composers such as Dori Caymmi, Gilberto Gil, Moacir Santos, Caetano Veloso, Hermeto Pascoal, Edu Lobo and Antonio Carlos Jobim. Jobim is well-known to American audiences, but some of the others less so. 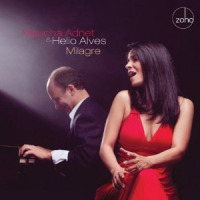 Maucha Adnet performed with Jobim and his group Banda Nova in the last decade of his life (1984-94), and possesses all of the talent necessary to elicit the subtleties of these melodists. It was in her performance of some of the lesser known composers' music that she delivered her best gifts to the audience. Adnet's phrasing and storytelling technique in tunes such as Lobo's "Canto Triste" (with lyrics by Vinicius De Moraes) unveiled the innovative intervallic melodic movement of the contemporary Brazilian ballad. We heard lines with haunting changes and the special texture of Brazilian Portuguese, with its myriad diphthongs and strange gutturals deepening the experience. The communication was powerful even if one didn't understand the language. Against the peregrinations of Adnet's lyricizing, Alves' counter-melodic voyaging provided further intrigue. 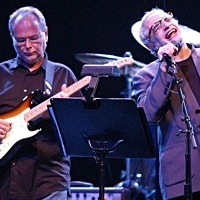 Cohen's flowing solos and Baptista'a polyrhythmic pulsations complemented the free feeling of the music. The absence of a steady beating bass instrument was at first surprising, but as the evening progressed its absence made sense. Much of Brazilian music needs to be performed without the rhythmic parameters our audiences are used to. This presentation of bonafide Brazilian creations at 54 Below will continue for the immediate future and it is a welcome addition to the Big Apple music scene.